I should probably have put this one up at Halloween! Hahahaha….Nuthin wrong with it now it’s good education in Death that you bring to Glam Guys like me! I think it’s a bit suspicious that the werewolf dude and Kip Winger have never been seen together in public. Wow, that stuff is pretty bitchin’! Makes me think of Venom and Mayhem (Deathcrush era), except it’s older. This sounds incredible. I’ll need to have a shifty of that compilation! Glad you enjoyed it. The comp is well worth checking out. If you’re buying it make sure it has the song Inquisitor on it. They has been a vinyl reissue recently that switched some tracks around. So if it doesn’t have that song on it, avoid! Strangely un-Italian names. Expats or made-up-for-english-speakers do you think? Some made-up-for-English-speakers stage names but I think the two main guys had anglicised their Italian names. The singer was Stefano Silvestri or something like that. Very interesting…saw on Wikipedia that they are still very much alive and very kicking! Yes, they’re still around although I read mixed things about their later stuff. They actually split up in 1984 and then the singer reactivated the band. But it’s just been him and various backing musicians ever since. I’ve only got stuff from the original band but I wouldn’t mind checking out more. The guitarist Paul Chain looks like he’s done some interesting stuff since too, including an album with Lee Dorrian of Cathedral. 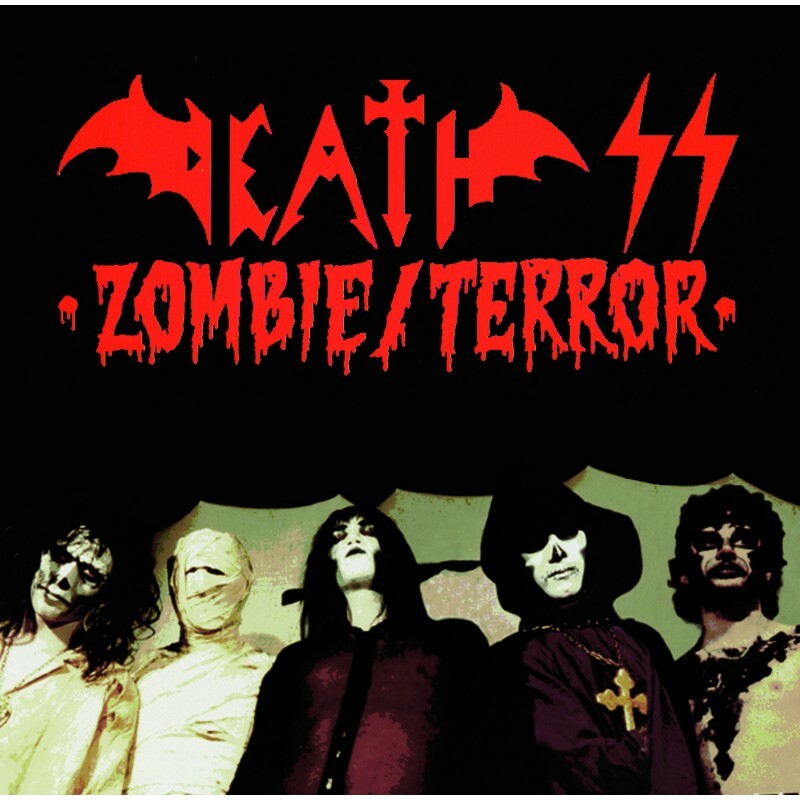 You can’t go wrong with the Story of Death SS 74 – 84 comp. It’s great. I’ve got a few singles too but that’s about it. Of the post-split albums “In Death of Steve Sylvester” seems pretty highly regarded so I’d like to get that one soon. A band and a genre that I know absolutely nothing about! But I do know that I love cover art so this reissue is cool for that reason! It’s worth owning just for that reason, definitely! I’ve got all 3 singles and it’s a great looking set, all 3 covers are cool. Now with 60% more corpepaint! And a chest wig too! Personally I have no need of chest wig. Au naturale. I’m a wolfchild honey, howlin’ for you. I’m thinking the odds of that being an Ian Astbury lyric are pretty high. Man that is obscure. Never even heard the name. They don’t get a lot of coverage here. Definitely pretty underground. I can’ t remember where I first heard about them but they’ve been on my radar for quite a while now. I only started buying stuff in the last year or so though. A couple of shops near me started stocking their stuff otherwise I might not have bothered. Leave it our HMO to dredge up the underground of the underworld! Listening to that youtube track and wow it’s rough, they sound like a garage band of amateurs. I know it’s a demo, but you’re right, that adds something to it, makes it even creepier than if it was perfect. Also, I love the first shite photey’s tagline. Only one problem, they have one too many guys to do a proper YMCA while they’re slaying. No, they need the extra dude: the hairy guy – sorry, the “Werewolf” – to do the slaying so the rest of them can do the hand movements and hang out with all the boys. Yeah, it’s hella rough. Hard on the ears but it does all add to the atmosphere. I think this is probably the two worst sounding songs they ever put out though. Their stuff gradually got a little easier on the ears… but only just! I don’t have a problem with bad production on demos. Hell, even on albums. GBV made whole albums on their boombox in the basement, still great. Lots of my old punk bands put less than full effort into sound quality on a lot of their releases, and who cares? Exactly. That comp you were discussing sounds cool. I’m pretty sure there were 5 or 6 folk in the Village People wasn’t there? I’m the same. Don’t have a problem with lo-fi demos or albums. Good music and songs always win out. Oh I haven’t got a clue. I couldn’t care less about the Village People. There could be a whole Village of them, it wouldn’t phase me, to be perfectly honest! 🙂 I was just yapping as usual. Good music wins out. Amen to that, brother!! Can I vote your YMCA comment as best photo caption of the century? Which one’s your favourite? I’m always torn between Sporty Death and Posh Death? Always been partial to Ginger Death. Although I think that’s also the medical term for drinking too much Irn Bru.